Enzo offers a complete range of products to help improve the quality and efficiency of your IHC process. Our high-sensitivity and low background reagents, combined with the market’s most extensive palette of unique chromogens, provide the flexibility needed for both simple and complex protocols. Over 1,000 IHC validated antibodies, including p16 and other clinically relevant markers. 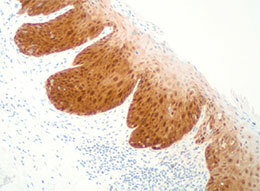 Request Your Free IHC Detection Reagent Sample Today! Click the button below to request your FREE IHC detection reagent sample. We'll be at the AMP 2017 Annual Meeting from November 16-18 in Salt Lake City, UT! Come chat with us at Booth #930 to learn more about our Pathology solutions, enter to win an Apple Watch, and pick up some of our cool gifts! We'll also be presenting a poster (#ID41) on our new comprehensive women's health panel so don't miss out!